* The second round of the Nigeria Premier League 2010-2011 kicked off yesterday. The best review can be read at George Akpayen’s excellent blog: http://naijaligue.blogspot.com. I have also made some observations on my own, based on yesterday’s matches, and all the transfers and rumors from the last two months. * Christopher Chigozie of Ocean Boys FC, who I wrote about in my post from 21.02.2011, has rather surprisingly joined league leaders Dolphins FC on loan for the rest of the season. Chigozie, an attacking midfielder known for his balance, close control and skill on the ball, made his debut for his new club yesterday. Chigozie scored seven league goals for Ocean Boys FC during the first round of the Nigeria Premier League. * Victor Barnabas, the strong and lively striker of Enyimba FC who I wrote about on 07.12.2010, is currently one of the hottest strikers in Nigeria. On 08.05.2011, Barnabas scored the penalty goal which made sure that Enyimba FC qualified for the group stage of Orange CAF Champions League 2011, knocking out Al-Ittihad of Libya. 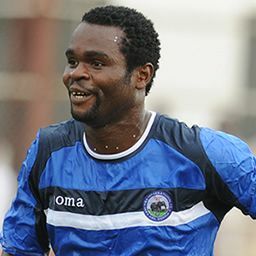 Yesterday, Barnabas scored his eight league goal for Enyimba FC when they demolished Dolphins FC 3-0. Barnabas goal came after a goal-mouth scramble and apparently he played a wonderful match, forming a strong partnership with Uche Kalu (born 14.11.1987). I have previously written that Kalu, the “Most Valuable Player” in the Nigeria Premier League 2007, joined the Vietnamese club Vissai Ninh Binh in January 2011, but I am now wondering I have confused Kalu with a different player. In any case, Kalu is currently playing for Enyimba FC, as he has been doing since 2007. Talking about confusion; in my post from 07.12.2010, I wrote that Barnabas most likely is in his early twenties. In February 2011, I found information suggesting that Barnabas was born 04.05.1988. However, a few days ago, the official website of Enyimba FC published an article where Barnabas was described as “25-year-old”, suggesting that Barnabas is born in 1985 or 1986. The picture of Barnabas is taken from http://www.enyimbafc.net. Josiah Maduabuchi (born 16.04.1988), the attacking midfielder / right-winger of Enyimba FC, is also at top form at the moment. Maduabuchi is arguably the most important attacking player at Enyimba FC, famous in Nigeria for having a good eye for the right pass. * On 11.05.2011, SuperSport.com published an article about Heartland FC having signed seven players: Kingsley Salami (Bukola Babes FC), Ahmed Suleiman (Enyimba FC), Charles Ikenna (Enyimba FC), Chinedu Ezimorah (Sharks FC), Onyekachi Akakem (Ocean Boys FC) and Kenechukwu Okoh (Enugu Rangers FC). Salami is a central midfielder, born 27.02.1987, who participated for the Nigeria U-20 national football team in the 2007 FIFA U-20 World Cup in Canada. Akakem is a central defender who has been a revelation at Ocean Boys FC this season. Left-footed forward Suleiman failed to establish himself at Enyimba FC after being signed from UNICEM Rovers FC. Suleiman is a speedy and strong player. Ikenna, a midfielder, was training with the Nigeria U-20 national football team earlier this season. Ezimorah, a central midfielder born 01.12.1985, was a few years ago regarded as one of the best midfielders in Nigeria, forcing his way into the Nigeria national football team and the Nigeria B national football team. * According to unconfirmed sources, Sunshine Stars FC has signed striker Eni Obasesam, the top scorer of Zamfara United FC. Obasesam has scored four league goals during the 19 first round of the Nigeria Premier League 2010-2011. Other reports suggest that Sunshine Stars FC is interested in Olufemi Thomas (born 05.08.1989), the giant goalkeeper at Ocean Boys FC. If the transfer takes place, Thomas will have a tough competitor in Moses Ocheje (born 21.05.1988) who is in top form and was vital when Sunshine Stars FC knocked out USFA of Burkina Faso from the Orange CAF Confederation Cup. * Ocean Boys FC is apparently experiencing a financial crisis but has apparently brought some interesting players to the club, including striker Dolapo Omotayo (born 22.10.1989), who played for Shooting Stars FC in 2009-2010, midfielder Abass Akanji, a former player of Akwa United FC and the Nigeria U-23 national football team, who failed to establish himself at league leaders Dolphins FC, and experienced right-winger Ikechukwu Okemmiri, formerly of Nasarawa United FC, Lobi Stars FC and Gombe United FC. * Watch out for Femi Ajayi, the 1992-born attacking midfielder at Crown FC. Ajayi forced his way into the first team of Crown FC during January, February and March 2011 and scored his first league goal on 13.03.2011 against Gombe United FC. * Plateau United FC could have made a smart signing in striker Emeka Onuoha (born 10.06.1988), a former member of the Nigeria B, Nigeria U-23 and Nigeria U-20 national football team. Onuoha was a fringe player at Enugu Rangers FC during the first half of the season. * Emeka Francis Atuloma (born 01.10.1992), the tall, elegant central midfielder of Dolphins FC, had trials with Norwegian top club Rosenborg BK earlier this month. Apparently, Atuloma will not be offered a contract at the time being. * Central midfielder George White Agwuocha (born 13.01.1993) of Sunshine Stars FC is described as a very exciting player with “vision and plenty of action”. Agwuocha scored for the Nigeria B national football team against Niger on 07.05.2011. Agwuocha played for the Nigeria U-17 national football team in the U-17 World Cup in 2009. Nigeria eventually won 4-0 and red hot striker Ekigho Ehiosun, arguably the best striker in the Nigeria Premier League, scored two of the goals. Ehiosun, currently playing for Warri Wolves FC, was presented in my post from 12.02.2011. If Ehiosun leaves the Nigerian shores during the next transfer window, teenage striker Oke Akpoveta is ready to take his place. Akpoveta, a former trialist at Odd Grenland(Norway) was described as a bright player with a “good shot” and “strong skills better than any other Norwegian 18-year-old” by Dag-Eilif Fagermo, the coach of the Norwegian side. Akpoveta scored his first goal of the season yesterday when Warri Wolves FC won against Kaduna United FC. « PART THREE – AGE-CHEATING IN THE NIGERIA U-20 NATIONAL FOOTBALL TEAM?